At Tamron, we line up Long Wavelength Infrared lenses (LWIR Lenses) along with the visible light and near infrared compatible surveillance lenses. Recently, the demand for LWIR lenses are growing and used for surveillance, such as, critical infrastructures, boarder, and coast lines, etc. 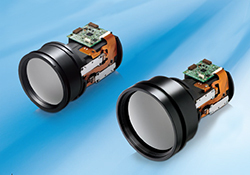 To match these various needs, Tamron have developed LWIR Lenses with unique features such as Vibration Compensation (VC), fast aperture and compact size.